Ballet – Ballet is the foundation of most forms of dance and a great place to start if you’re unsure what to take. Tap – For those children with restless feet and a need to hear themselves may we humbly recommend tap. Big noise and big fun rolled up in a 45-minute class! Modern Stage – For the future performer in your life we blend singing and jazz technique into an all out performance. For those born to be on the stage, this is their start! Ballet – For girls we recommend pink tights and body suit and an optional pink chiffon skirt, accompanied by pink ballet slippers. For boys we recommend shorts and a t-shirt in good repair combined with black ballet slippers. Of course if they want to wear a tutu, they can. Tap and Modern Stage – For girls we recommend a black body suit and tights and for boys shorts and a t-shirt in good repair, however ballet attire is fine. For footwear, tap shoes for tap and black ballet slippers or jazz oxfords for modern stage. All of these can be purchased from Performing Fabrics and Dancewear, or from Walmart or Payless Shoes . Our parents group also sells used dance wear and at this age, it’s pretty universally lightly worn. This is a great option if you want to keep your costs down while trying dance for the first time. 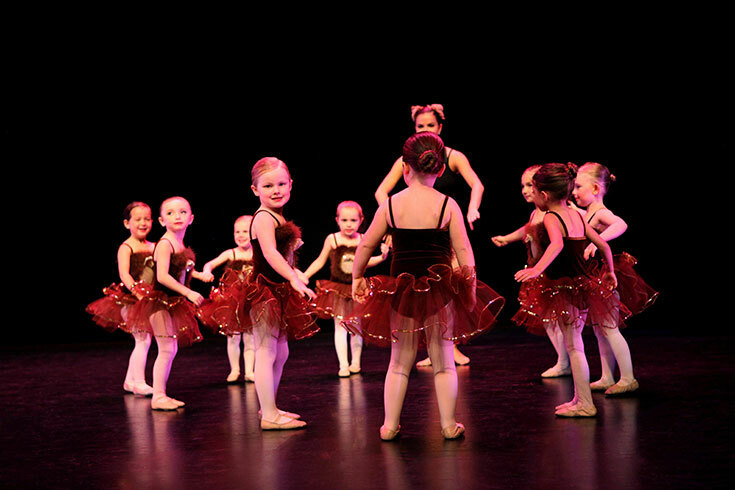 What if my child tries dance and doesn’t like it? Perish the thought, but if your child isn’t ready for dance yet we’ll give you a pro-rated return on the classes remaining or hold the remainder as a credit toward a future session.